Kotake gulped nervously and relunctantly followed Koume into the temple. I really didn’t mean it, she thought desperately, taking back her denial of the Sand Goddess. Standing hunched beside Koume, she warily eyed her surroundings. The daylight flooding in from the entrance only allowed her to see so far into the cavernous room, but it was enough. Right in front of them, were the two cobra effigies they had learned about as children. They were supposed to make their offering to the Goddess of the Sands here and receive her blessing in return. Koume tread slowly towards one of the statues. She could make out some sort of script carved into the stone, but the light was so dim that she couldn’t read it. “We need to make the cut,” she said, turning away from the effigy to look around the room for something sharp. “We could just use the blood from our bites?” suggested Kotake, wincing at the thought of hurting her already injured body further. Kotake shrugged, accepting what she had to do. She knew that, to complete the ritual, she needed to smear her blood on the effigy of the snake and bear the scar of her offering for the rest of her life. But it didn’t mean she looked forward to more pain. “I’ve got it!” exclaimed Koume excitedly, as she smashed a small clay pot that she found nearby and raised a sharp shard of it in triumph. Sighing, Kotake held out the palm of her hand as Koume dragged the shard of pottery along her skin. Surprisingly, the incision didn’t hurt that much, but her blood poured steadily from the wound. She heard Koume’s quick intake of breath, and knew that she was also ready to make her offering. Each sister placed her hand on a separate cobra effigy and allowed their blood to seep into its stone. Immediately, a cold wind whistled through the temple. It blew in all directions, tangling through Kotake’s hair and rushing noisily against Koume’s ears. A brilliant, fiery red glow flashed throughout the room, blinding them momentarily. The whistling of the wind became a tinkling laugh, and the sisters opened their eyes. A woman so beautiful, so positively captivating, stood in the middle of the room. The girls could not look away. The woman had waist-length, flowing red hair — a crimson that dulled the brightest blood moon — and her eyes were a shade of blue that seemed to shame the sky itself. Her skin, a deep, flawless bronze, glittered faintly in the meager light. Her lower arms and legs were wrapped in cloth of gold, while she was garbed in what looked like snake skin. The scales clung to her body as though they were part of her and shone like jewels of precious emerald and silver. Kotake leaned tentatively out from behind Koume’s shielding body. “She’s the Sand Goddess!” she whispered in fear and awe. The Goddess of the Sands stepped towards the sisters, her eyes flashing coolly at Kotake. “So, you believe in me after all?” she questioned in a deceptively sweet voice. Koume was silent in disbelief as she reasoned with herself. The Goddess of the Sands wouldn’t have appeared before us; it’s unheard of! “I watched your journey,” the Goddess continued in that sweet voice, as she seemed to glide elegantly across the room. “You did well, with such danger in your path.” She now stood right in front of the sisters. Kotake’s voice broke free from her thoughts as she cried, “You’ve seen what we went through and you didn’t aid us!” She had trusted that this was, indeed, the Sand Goddess, and that they had been abandoned by her. The realization broke her heart. The Goddess lifted her gaze and raised her palm against the sisters, “Dream,” she muttered. Koume and Kotake crumpled in a sorry heap to the floor. The Goddess of the Sands opened her eyes and looked upon the beauty of the world for the first time. A haze of swirling colors became a vibrant and mesmerising landscape, with hills of every shade of green, stretching to meet the clear, blue sky. The land was abundant with plant life, reaching lovingly towards the brilliant sun, and the sounds of trees moved by a gentle breeze filled her ears. The smell was almost indescribable, as though she could smell the very life of the land around her. It ensnared her senses. A voice, no body nor mouth to echo from, called to her. It simply said, “You are Daenia, and unto you, we gift the West.” She felt warmth in her body and rose to stand tall. Then, she heard another voice with no source, which simply said, “You are Hylia, and unto you, we gift the East.” Daenia turned and looked upon her first companion in life, her twin, blood of her blood. Although they did not look the same, their souls recognized each other. She watched as Hylia stood and smiled, and then took her hand. A third voice sounded, giving instructions that the world should be cared for and protected by them both, before silence engulfed the pair. Time moved on in a blur of color. 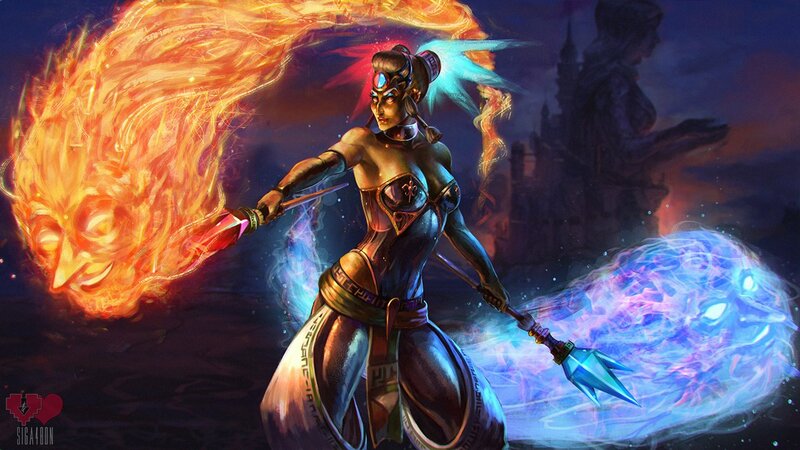 Daenia glowed with a righteous serenity as she and Hylia explored the world, discovering flowing rivers and lush forests, towering mountains and endless deserts, and eventually the wondrous creations of different races. Everything they touched flourished and prospered, and their guidance became revered among all living creatures. Daenia noticed creatures built in her own image: men and women with flaming red hair and bronze skin that followed her footsteps, worshipping her and making sacrifices to her grace. Hylia turned away from these people, sickened by their sacrifices of other living creatures. Greatly offended, Daenia’s people began a conflict against those built in the image of Hylia, and violence began to permeate the land, spreading over the center of the world. Time once again sped forward. Daenia and Hylia embraced each other in a heart-breaking farewell. Daenia set out with her people on a journey to the West, while Hylia lead her people East, in the hopes of diminishing the hatred between the races through a temporary separation. Hundreds of years passed as Daenia’s people settled in the desert. They became hardened by the burdens of the West, but remained faithful to their Guardian Deity, naming her the Goddess of the Sands. Daenia blessed them with tropical fruits and cleansing rivers through the harshness of the desert lands, and so the people built her a temple of worship. Eventually, when Daenia believed that her people had forgotten their strife with those made in Hylia’s image, she led them back to the center of the world. But, alas, peace was not to be had. Hylia’s people were not ready to receive them, and they were chased mercilessly back to the brink of the desert. Daenia was angered that Hylia did not intervene in her people’s actions. “I cannot control their will!” Hylia cried penitently, when Daenia demanded that she bring her people to heel. Daenia returned in a storm of fury to the West to find her people gravely injured and thirsting for revenge. She did not attempt to dampen their rage, nor did she try to stop them when they crept like shadows into the East, to steal materials in which to fashion dangerous weapons. Daenia’s people named themselves Gerudo, meaning Great Warrior, and fortified their settlements into an impenetrable fortress. Finally, they marched towards the center of the world once again, lusting for Hylian blood. Still angered, Daenia allowed them to march forth, but she herself did not mean to go to war against her sister. For Daenia, this was not a war for Goddesses, and so she remained in her temple. Eventually, Daenia received the news of the Gerudo defeat at the hands of no other than her sister, the Goddess Hylia. Insane with the pain of betrayal, Daenia demanded reparations from her twin. She would not listen when Hylia explained that she had only protected her people. She could not accept that Hylia had not used her divine powers to ravage the Gerudo army. Climacteric words were exchanged, and Hylia walked away from their friendship, their sisterhood, and their bond. Daenia’s heart shattered beyond repair at this loss, and her enmity at the Hylians exploded across the earth, causing a deep fissure from which dark and treacherous beings emerged and spread throughout the land, slaughtering all in their path. Daenia returned to her people and to her temple, unfeeling in remorse as the world around her suffered at the cruelty of the demons that she had released. Drowning in the sorrow of her sister’s abandonment, Daenia was unable to care for her people. The Gerudo prayed and begged for her sustenance but Daenia could not heed the needs of her people. And so the rivers dried up and the trees wilted and bore no fruit. No life could come to the land, only death. Only pain. Until one day, somebody understood. He whispered words of comfort in her nightmares, as he stole into her heart and mind, offering an end to her anguish and encouraging her thirst for sweet revenge. Daenia gratefully clung to this unknown lifeline and rose once more to watch over the West. The Goddess of the Sands was distressed to find her people starving and unable to defend themselves against the monsters that had overrun the world. She gathered her divine powers and rained vitality upon the Gerudo, but the onslaught of attacks by the shadows from the deep did not lessen. Daenia’s people were dwindling, and she did not know how to protect them against such a countless foe. Men, women, and children were ripped viciously apart as the invasions continued. Then at last, she heard that sweet voice of the man from her nightmares once more. Raising her tear-filled eyes from the ground, Daenia at last set her sights upon its bearer. He anchored Daenia’s heightened emotions and offered her a repose from the horrors and destruction that followed the demons from the fissure. He promised peace for her people and vengeance for the wrongs that had been done to them by the Hylians. All that he needed in return, was a trivial thing. Something which Hylia had horded selfishly to herself. In fact, he, the great Demise, would share this item with Daenia. Demise explained that with the Triforce, Daenia could wish for anything that she wanted, and it would be granted to her. Daenia’s anger with her twin grew more ferocious with the belief that Hylia would hide such a treasure from her. Daenia vowed to bring the Triforce back to the West. So it was, that with Demise, she set a plan in motion. Time spun on in a whirl of color once again. Daenia and Demise marched across the plains of the earth with a horde of wild beasts and Gerudo at their heels. Their number was beyond count as they rumbled towards the center of the world, burning and crushing all in their path. Demise carried a masterpiece of weaponry: a magnificent sword that he pointed forward and ahead, instructing his minions to go forth and destroy all that stood in their way! The demons and shadows set upon the fields, villages, and towns of the land, devouring all that stood in their path. The Gerudo eagerly followed the monsters, their own swords flashing as their battle-lusting cries filled the air. Daenia surveyed the scene with satisfaction. Her people would not crawl back to the desert, beaten and bloody this time. The Gerudo would rule the world and prosper well, as they deserved. And she would use the Triforce for her heart’s desire. Demise intruded upon Daenia’s thoughts as he urged her to move forward. He gestured towards the battle that had now covered the land as far as the eye could see. Daenia raised her hand against the legion in front of her and forged a path through which they could make their way to Hylia’s temple. As Daenia traversed this distance, she witnessed the true devastation of war. Her own Gerudo lay maimed and dead before her, while the injured cried out pleadingly for her help. When she bent to aid them, Demise turned her back to the path ahead and encouraged her speed. The injured can wait. He will grant them their peace when he holds the Triforce at last. When they arrived at Hylia’s temple, Daenia looked upon the wondrous workmanship of the Hylians, and it sickened her. The stone work was an artistry in itself, and when Daenia caught sight of the effigy of Hylia in all her glory, she was gobsmacked! The Hylians had recreated their Goddess’s image in the whitest stone, and her divinity seemed to exude from the expression on her carved features as she surveyed the land for miles in front of her. Turning from the carved stone tribute of her twin, Daenia found Hylia desperately gathering her people into hiding. She felt a white-hot anger searing inside her. “You would protect your Hylians when they are guilty of such murder and hatred?” she questioned furiously. Demise unsheathed his magnificent sword and stepped purposefully toward Hylia. He demanded that she relinquish the Triforce, or her people would face his murderous hordes. Hylia denied Demise his request, and so he raised his sword against her. Hylia crossed her arms in front of her chest and Demise was blasted powerfully backwards. Daenia couldn’t stand that her sister would not hand over the Triforce. She couldn’t bear that Hylia had not shared this hidden treasure with her, and so she let out a scream so shrill that it rendered the thunderous battle around her into silence. “Share the Triforce, or it will be your undoing, sister!” she threatened, tasting her own bitter hate, as Demise advanced menacingly once again. Demise summoned his warring hordes to form an inescapable ring around the area where he, Daenia and Hylia stood. He emanated a dark and terrible power as he bore down upon Hylia, who dodged his blows with a graceful agility. The monsters surrounding them were closing in, making the ring that encircled them smaller and smaller, leaving Hylia little room to avoid Demises flashing blade. Hylia was using her divine powers to keep Demise at bay, but soon she would tire and be trapped within his grasp. Demise taunted Hylia, preying on her weakness for her people, while he closed in on her. Each time he swung his blade, it was as though the air itself shook and vibrated. It seemed impossible that Hylia could escape. Just as Daenia was sure of their success, she heard the angry screeches of the monsters around her, as enemy warriors broke through their circle. These warriors had the markings of an eye drawn in ink on their faces and seemed not to care for their own lives as they battled ferociously through the demons. Daenia turned quickly back to the battle of Darkness and Light, just as Demise was caught off-guard by an attack from Hylia. His sword flew from his grasp, and he found himself trapped in place by an invisible force, as his life’s matter was sucked, piece by piece, back into the earth from whence he came. Upon hearing their master’s roar of rage and seeing him absorbed into the land below them, Demise’s minions scattered like the wind, abandoning him to his terrible fate. The remaining Gerudo were left to witness their Goddess’s failure, which only drove Daenia further to her madness. She grabbed the sword which Demise had dropped and felt it throb forcefully, as though it refused to acknowledge her as its mistress. Daenia ignored this and rushed at her sister, determined to battle! Hylia, seeing the danger just in time, stepped easily out her way, a single tear falling, glistening down her cheek. Hylia summoned a beautiful sword of her own, which materialized from the air in front of her. The blade was the colour of perfect silver, unblemished by the stain of battle. It’s hilt was ornately crafted and beautifully designed, and adorned with an exquisite aquamarine gemstone. She grasped it and sent a steely look in Daenia’s direction. “I did not want this, sister!” she stated, plainly. Daenia summoned up every ounce of hurt and betrayal that she believed Hylia had caused her over the span of their lives. She revelled in the shattering of her heart as she thought of how her Gerudo had been mistreated, humiliated, and destroyed in their battles with the Hylians. Then, she focused that pain on one thing: obtaining the Triforce. Daenia raised her weapon and entered into battle with her twin. As the sisters fought, the clouds opened up and a torrent of heavy rain flooded the battleground, as peals of deafening thunder and blinding lightening shook the sky. The effects were apocalyptic to behold. Swords clashed with an almighty force and the battle of the Goddesses looked as though it were some ferocious yet poetic dance. The Gerudo tried to aid their Goddess, but the tattooed folk restrained them, blocking their path. This battle between the Goddesses was cataclysmic and seemed to last for hours, but, finally, Daenia managed to strike Hylia and her pure, crimson blood ran from a shallow gash in her shoulder. But instead of the pleasure of a small victory, she felt the crushing weight of regret. Momentarily distracted by this emotion, Daenia left herself open to Hylia’s sword. Hylia forced her to the ground, her blade glowing with divine power against Daenia’s throat. Hylia gasped at Daenia’s prophecy, and, at long last, anger flashed across her face. “I will do all in my power to protect the people of this land!” she replied furiously, as the ground beneath their feet began to rumble and crack. Daenia watched in a strange fascination as the land behind Hylia broke away from the earth around it with cataclysmic force and rose steadily into the sky. Immediately, she was sickened by the belief that Hylia had used the Triforce to manage such a feat. Hylia raised her other hand against Daenia, who felt the elements rushing around her in a storm of noise and color. She drowned, burned, and suffocated, all at the same time, before she found herself alone in her own Temple. She rushed towards the exit and found herself repelled forcefully backwards.